He's not everyones cup of tea but a good insite into the aircraft, what it took to keep it flying and indeed the men who were our front line for much of the cold war. shellspeed wrote: He's not everyones cup of tea but a good insite into the aircraft, what it took to keep it flying and indeed the men who were our front line for much of the cold war. It was a really good interesting program. 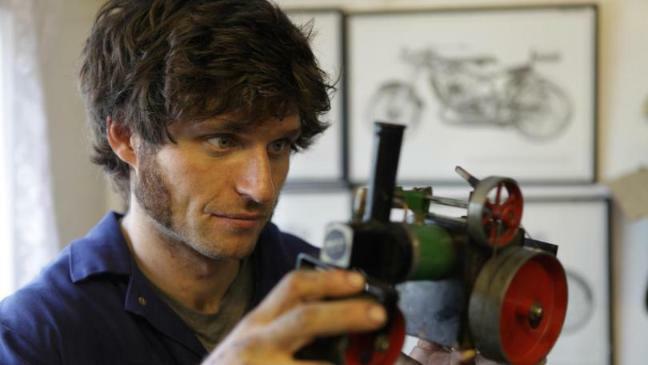 I really like Guy Martin. I've watched all his TV programs from the boat to records and his trip round India. I hope he stops TT road racing after his crash on the Isle of man this summer. The BBC should sign him up ASAP To make some programs for kids. He's more interesting than Blue Peter. Last edited by Jazz Club on Sat Dec 05, 2015 7:43 pm, edited 1 time in total. Jazz Club wrote: ...I hope he stops TT road racing after his crash on the Isle of man this summer. TV needs him. Couldn't agree more, had the same thoughts myself. just looked on tin ter net and it seems lots of other folk think so too! Ohh! That's a Mamod 1312 steam road roller if I'm not mistaken. Coyote Jim wrote: Ohh! That's a Mamod 1312 steam road roller if I'm not mistaken. Hands off. I own that. It was a great program about a great aeroplane. I wanted one of those toy real steam engines on a red/green base in the 60s. My mother wouldn't let me have one. She knew i would of blown it up. They used to buy me cars when i was a young kid. Show them to me and then just give me the tyres to stop me crashing them. It was a form of child abuse. I used to take the rubber tyres off my toy cars then I progressed to taking a screwdriver to them and then rebuild them. Coyote Jim wrote: I used to take the rubber tyres off my toy cars then I progressed to taking a screwdriver to them and then rebuild them.